Yesterday at the Session beer festival, for the first time at a festival in Ontario we poured Garrison, both the IIPA and Hop Yard Pale Ale. For many of the patrons there, Garrison was an unfamiliar brewery, and we described the beers to interested drinkers who seemed to quite enjoy both beers. And often we fielded the question “Are these beers available in Ontario?” to which we replied, “Well, the IIPA is coming to the LCBO in September as part of the Autumn release” and “We’re working on it” for the Hop Yard Pale Ale. But this sparked quite a bit of talk about Garrison’s presence in Ontario – so I’d like to share a story about two Garrison beers that you won’t be seeing in Ontario for the immediate future. At the beginning of this year, coming off our successful acceptance of Garrison IIPA into the Autumn seasonal release, we wanted to submit into the Winter Warmers release at the LCBO. The Winter Warmers release called for “Products appropriate for Winter (i.e. Imperial Stouts, Barley Wines, Old Ales, Spiced, Strong Ale, Oak aged beers)”. The product call also asked for “Single serving format preferred (500mL)”, “Proven track record in other markets” and “Renowned or award winning”. OK, Garrison has a couple of beers that fit that bill very well. So we submitted both the Grand Baltic Porter (BA / RB) and Winter Warmer (BA / RB). 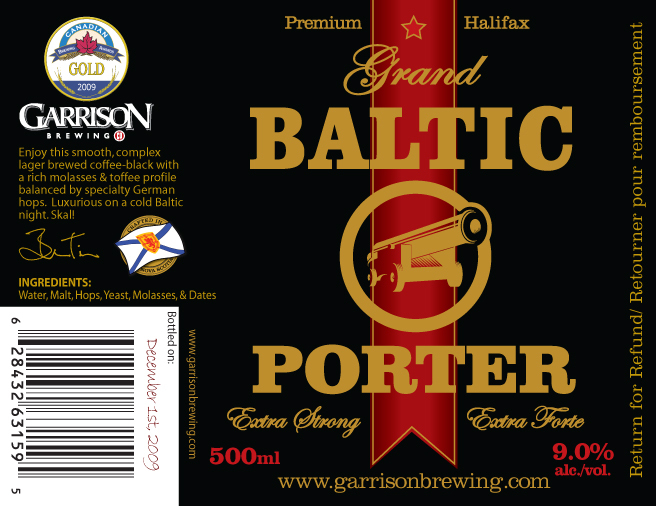 The Grand Baltic Porter is one of the only of its kind in Canada, a rich, strong beer inspired by English porters and Russian imperial stouts. At 9% it was certainly hearty, came in a single 500mL bottle and had been awarded Golds at the 2009 Canadian Brewing Awards, World Beer Championships and “Innovative Product of the Year” at the Taste of Nova Scotia Prestige Awards. Slightly less renowned that the GBP, the Winter Warmer was a strong, dark amber spiced brew that took home a trio of silver medals at the 2009 Canadian Brewing Awards and the 2009 and 2010 World Beer Championships. So we felt we had a couple of strong candidates for the release. Just so everyone knows, what was mentioned above is all the LCBO tells you they are looking for. The process that an agent must follow is to submit samples of the beer for tasting, plus a “one page marketing plan” that details the beer characteristics, awards and intended marketing support if the beer was to be released in market. We did so. A couple of months pass, the beers are tasted by the LCBO (not sure who actually tastes them) and I receive e-mails from the LCBO saying both beers were declined. The only reason given in the form e-mail was “Other product submitted performed better against selection criteria”. This was certainly unfortunate. What was this selection criteria exactly? According to the product call, the beers fit what the LCBO was looking for. I was not satisfied with this reasoning so I requested a bit more clarification from the LCBO. After all, with the decline for this release the next time the beers would be appropriate would be the winter warmer release another year from now. The LCBO got back to me and explained that it was a competitive product call (about 80 beers were submitted, and about a dozen or so are picked) and that the beers “showed well in the tasting”. But the LCBO also wanted to see how the IPA would perform in the Autumn release and that they wanted to offer variety from release to release, implying that they didn’t want to release two Garrison beers consecutively. These two reasons – wanting to see the sales performance of the IIPA first and looking to ensure variety from the Autumn to Winter releases – basically made it a foregone and predetermined conclusion that Garrison would not be accepted into the release. Now, I understand the business rationale of the LCBO. I am a vice-president in the business world and I see their logic, from a dollars and sense point of view. But what is unfortunate for beer lovers in Ontario is that these two excellent beers (Grand Baltic Porter especially) will be completely unavailable to consumers. Aside from The Beer Store, which is an unrealistic avenue, we don’t have another option to get these products into the hands of beer lovers (private ordering is possible, but consumers would have to order full cases which is costly). In other competitive industries, if a particular store buyer chooses not to stock a product, other stores can decide to do so. In Ontario, this is not the case. I cannot go to another store to see if they would like to stock Grand Baltic Porter or Winter Warmer this winter – we just don’t have any other stores. This demonstrates the fundamental issue I have with the system in Ontario – there is no competition or alternatives to the LCBO. Until we do, these kinds of unchallengeable business decisions will keep great products out of the hands of beer lovers in Ontario. I heard that Trafalgar’s new Bock got accepted and lord knows it didn’t beat Garrison in a taste test. My, My, LCBO. Shame on you. If anyone’s interested, here’s the Winter release from 2009. The 2010 release has not yet been announced. The LCBO has no interest in taking on interesting beers — their only motivation is to keep the profits rolling in to try to keep up the justification for keeping them a monopoly. The beer store’s only interest is to be an outlet for it’s owners…who sadly are foreign owned corporations. Ontario needs another option. I want beer (and wine) in corner stores and grocery stores. Quebec does it. Society doesn’t crumble. The province can make more money taxing private stores than they could by continuing to run the LCBO. How can they continue justifying this post-prohibition model??? This is the biggest reason I homebrew. The Beer Store and LCBO just don’t care about good beer. If they allowed corner beer stores in Ontario, I would open one in a minute. It would be stacked to the roof with interesting beers from Ontario and the rest of Canada. No mega-swill allowed. Wake me up!!! I guess I was dreaming. I am lucky that my mother-inlaw just brought back a porter from a business trip. The thing I don’t understand is that the critically acclaimed beers fly off the shelves…at least in T.O. Why not expand the selection beyond 12 for starters!